Sarah is one of our awesome team members who specializes in coordinating all the moving parts that go into campaigns, presentations, infographics — well, basically all of our marketing projects. She is super organized, and never misses a deadline. Describe your role on the USGBC Marketing Team: As a Marketing Project Coordinator, I help manage marketing projects from conception to completion, translating design direction into visually compelling creative. I collaborate with and manage internal/external designers, stakeholders, program liaisons and third-party vendors to create marketing collateral that elevates USGBC’s brand. I also help conceptualize and design digital, multimedia and graphic assets. Favorite sport: Soccer, aka the beautiful game, aka fùtbol. If you could sing one song at Karaoke Night, what would it be? Piece of My Heart by Janis Joplin. How do you stay inspired at work everyday? Knowing that I am supporting a mission that I am passionate about is uplifting. I am also surrounded by some incredibly talented people on my team and the creative work we collaborate to produce keeps me inspired daily! You were just gifted a yacht: what would you name it? I’d name it after my favorite book & movie of all-time, Gone with the Wind. Best book you’ve read in the past year: This is like choosing your favorite child for me! I’m currently reading my way through the New York Times “1001 Books to Read Before You Die” list, and I’ve knocked off 710 books. My favorite from this year has been “The Red Queen” by Margaret Drabble. My favorite new book on the list was “The Curious Incident of the Dog in the Night-Time” by Mark Haddon. Favorite guilty pleasure TV show to watch: Law & Order: SVU. 3 things you’d take with you to a deserted island: a soccer ball, sunscreen and a fishing rod. Biggest fear: I am terrified of spiders, snakes… and squirrels. Our innovative Studio team is comprised of marketing strategists, digital analysts, designers and developers. This supergroup is responsible for making sure that USGBC communicates with the world in the most effective and compelling way while maintaining our standards of sustainability. The only way we can accomplish this is through collaboration. Glad you guys took the time to meet Sarah — stay tuned to meet the rest of our talented team members! Nia is a member of our supergroup who specializes in beautiful graphic and web design. She’s an integral part of producing marketing collateral, digital products and beautiful graphics. Oh, and she is the brilliant mind behind USGBC Studio. No big deal. I’m a graphic designer (print + digital). What designers inspire your work everyday? I pay daily homage to the designer(s) who invented the grid system. I tend to draw inspiration from all types of artists. Currently, I’m really loving the work of Mara Hoffman (fashion designer), Andrea Pippins (graphic designer), Lisa Lapointe (pencil artist) and Brianna McCarthy (painter). Are you a morning person, or night owl? Not packaging design files. Grrr. Our innovative Studio team is comprised of marketing strategists, digital analysts, designers and developers. This supergroup is responsible for making sure that USGBC communicates with the world in the most effective and compelling way while maintaining our standards of sustainability. The only way we can accomplish this is through collaboration. Glad you guys took the time to meet Nia — stay tuned to meet the rest of our talented team members! At USGBC, we have a number of beautifully designed and informative print collateral. However, in this day and age, there is a high demand for accessing information on a variety of devices—which means converting print media for digital viewing. Study the print version. 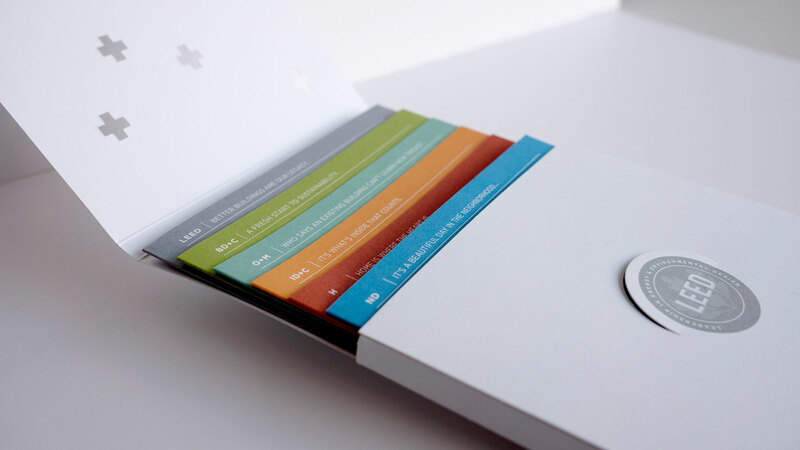 For USGBC’s LEED collateral, each rating system print piece has its own color scheme. All of the pieces fold up neatly and are stored in a folder. Both of these ideas can be maintained in the digital version. Develop the digital concept. A microsite made sense since it’s an easy way to share and distribute information. The print version consists of six pieces, which translates to a smaller website that is easier to code and control. Instead of using a folder to tie together all the rating system cards, we created a homepage that serves as a landing page—showcasing the collateral’s colorful cover art. For each rating system page, we created a single scrollable page to make it quicker and easier to access all the information on a given rating system. Brainstorm and finalize the overall look. Before I could get started with coding and building the site, we needed to make sure the whole team was on the same page with the look and feel. We planned out the layout for the homepage as well as one of the rating system specific pages. In web design you need to design to a grid, and keep in mind how the site will look at different breaking points when a browser window is resized. That means it’s better to design vertically as opposed to adding lots of columns. Coding and research. Next it was time to roll up my sleeves and get to work—coding a responsive microsite. I also did research on ways to make the site more dynamic and interesting, like using scrollable background images, text and images that fade in/fade out as you scroll, and CSS hover animations. Testing and launching the site. It’s important that a design looks good across browsers and devices. If you only code and test a site for one browser, chances are you’ll run into a lot of surprises when you look at it in a different browser. Once I tested the new microsite and corrected any coding bugs, it was time to start sharing the URL with the rest of the world. So there you have it—the process that brought together one of our latest microsites. Check it out at leed.usgbc.org. In our department we spend a lot of our time creating schedules, setting deadlines and responding to emails. But that isn’t all we do! We also schedule time to be creative and inspire each other. Our social media videos take a lot of creativity—and a lot of hands—to create. Not only do we want to produce visually interesting videos for our social media followers to enjoy, but we also want to focus on LEED, green building and the sustainable market. It’s hard to stay current in our industry and also be creative. That’s why collaboration is so important. When we need to create a video for social media, sometimes it means spending a couple hours in our Knowledge Center creating. We brainstorm, cut and paste, and shoot together. It’s super satisfying to have a final product that everyone had a hand in creating. Our #USGBCfamily knows the importance of taking time out to get collaborative and creative; all in a day’s work! #USGBCfamily knows the importance of taking time out to get collaborative & creative; all in a day’s work! Since we have taken on the challenge of producing more and more videos for our social media followers, we have realized how much people enjoy them. Everyone has busy schedules these days, and this means our content we put out there needs to be easy to quickly take in. Our videos are a quick way to celebrate an event, announce something or educate our followers. How do you use videos and social media to effectively communicate? Don’t forget to check out our Vine channel, and Instagram to see the latest video creations!